eLuxury is an online mattresses company that was founded by Paul Saunders. Mr. Saunders is a former Marine officer, and eLuxury has been offering quality mattresses at a quality price for five years. 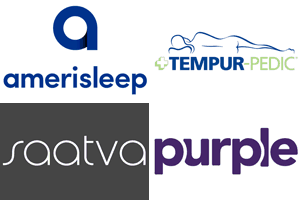 They also create bedding, pillows, toppers, and other sleep-related products for their customers. The latest mattress from eLuxury uses a gel-foam construction and it is targeted at a broad customer base. It has a medium-firm feel and uses two layers of foam to offer a restful sleep experience. Should I Buy the eLuxury Mattress? The eLuxury mattress uses two layers of foam and measures at 10” thick. This thickness is in line with other mattresses at this price point, and will usually be enough to provide support for heavy, average, and light sleepers. Sometimes foam mattresses can sleep a bit hot, and eLuxury attempts to counter this with the gel infused first layer, while relying on a different type of foam for the support layer. The eLuxury mattress consists of two layers, a top layer and a bottom layer. Top – The top layer of the eLuxury mattress is designed for cooling, comfort, and support. It is made from 3” of gel infused memory foam. This provides good support, pressure point relief, comfort, and cooling for the mattress. The gel infusion helps to aerate the foam layer, making it more breathable and helping with cooling. The gel also works to pull heat away from the sleeper so that the mattress can dissipate it, providing a cool sleeping surface. Bottom – the bottom layer of this mattress works as deep compression support and provides a foundation for the mattress. It is constructed from 7” of support foam, and works to offer the deep compression support that heavier sleepers require. As you can see, the two layer design of the eLuxury mattress attempts to do a lot of things. The gel-infused first layer focuses on comfort, cooling, and support, while the foundational layer provides support for deep compression and supports the rest of the mattress. 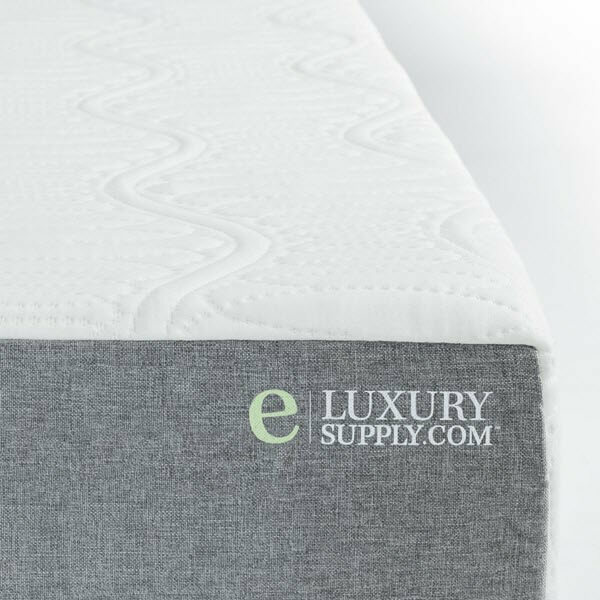 The cover of the eLuxury mattress fits in with the standard design that most online foam mattress retailers are using. It consists of a white top and bottom with gray side panels. The white fabric is made from an 80/20 blend of polyester and spandex. This combination of materials provides a soft sensation. Moreover, this combination of materials is also highly breathable, which helps to keep the surface of the mattress cool. Moreover, it’s a very thin material, so sleepers will feel closer to the top layer of foam. The side panels are constructed from 100% polyester. This enhances their durability and helps them stand up to all the things that can happen to the sides of a mattress. The 100% polyester blend is also a bit stiffer, which helps the mattress retain its shape and provides more edge support than you would get with the 80/20 blend that is used on the top of the cover. On the whole, the cover is adequate. It’s a very basic design that almost every mattress supplier uses, but most people don’t buy a mattress for its cover. After all, as long as the cover does its job, then it’s good enough, as it will be covered by sheets most of the time. The eLuxury Supply mattress has a medium-firm feel. 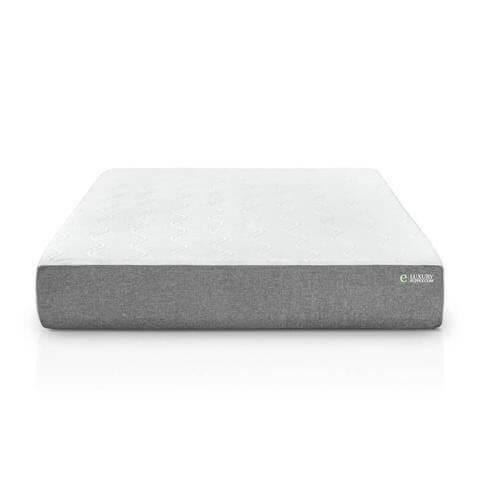 On a scale from 1-10, with 1 being the least firm and 10 being the most firm, it ranks at a 6.5.This is a bit higher than most other foam mattresses at the price point, so if you’re looking for a firmer feel but enjoy the sensation and rest that memory foam offers then it might be a good choice for you. Another thing worth noting about the eLuxury Supply mattress is that it doesn’t have nearly as much hug and contour as other foam mattresses we’ve looked at. As a result, the mattress has more of a floating feeling than other foam mattresses, making it a good choice for people who don’t like to feel gripped by their mattress. In addition to being a bit more floaty, this trait helps the mattress cool down, as the body isn’t pressed as much into the foam. This contributes to the breathability of the mattress and its airflow. When it comes to bounce, the eLuxury Supply mattress is about average. There’s not as much bounce as you would encounter in a coil or innerspring mattress, but there’s more bounce than you would expect from memory foam. The responsiveness of this mattress is also better than you generally get with foam mattresses, and it regained its shape nicely. This helps prevent a sinking feeling and the mattress feeling loose as you move around in your sleep. Like all mattresses we look at, we put the eLuxury mattress through a series of sinkage tests. Sinkage is a good way to get an idea of how the mattress will respond to your body and how well it will hold up over time. Our tests were conducted using an individual weighing ~140 lbs. The amount of sinkage that you encounter might be different based on how much you weigh. Laying on Back – when laying on the back in a standard sleeping position and weight distributed evenly we were able to measure 1” of sinkage. Laying on Side – when laying on the side in a standard sleeping position with weight evenly distributed, we measured 2” of sinkage. Slight Edge Sit – sitting on the edge with feet on the floor so that the mattress did not have to support the full weight of the body created 3.5” of sinkage. Full Edge Sit – sitting on the edge so that the body’s full weight rested on the mattress resulted in 3.5” of sinkage. We’d like to note that there are a number of deals and promotional discounts for the eLuxury Supply mattress available online, so look around and see if you can save some money before paying full price for this mattress. The promotions that eLuxury Supply offers are better than most online offers, with savings as much as 20% off the whole order. Savvy consumers will notice that the prices on the larger eLuxury Supply mattresses are lower than they are for many of the company’s competitors. This means that the eLuxury Supply provides a great value for cost. Shipping – Shipping is provided free of charge. The mattress will show up compressed into a box at your door in 2-7 days. Warranty – 10 years, which is standard for the industry. Trial – eLuxury offers you 120 nights to decide if the mattress is right for you, which is a bit more than the standard 100 nights that most other companies allow. We don’t think that making a great mattress for a good price is the only thing we should look at when reviewing a mattress. The company behind a mattress is just as important to us. eLuxury offers a level of customer service and appreciation that’s hard to find matched anywhere. Every purchase comes with a handwritten thank you note, they donate to several charities and non-profits that support veterans, military service members, childhood education, and more. All of this indicates that you’ll likely have a positive experience with eLuxury Supply, and shows that you should expect great customer service and care. There are many groups of people who will enjoy the rest they get with the eLuxury Supply mattress. First, people who are looking for a medium to slightly firm mattress will enjoy the unique combination of traits created by the different layers of foam in this mattress. Moreover, the company offers mattress toppers that can be used to provide a softer feel, meaning that you have a way to make the mattress even more comfortable if you like many of its qualities but would prefer a softer mattress. The eLuxury Supply mattress is also a great choice for those who like the sensation of memory foam, but want minimal contour and hug. The firmer nature of this mattress means you still get the comfort provided by some hug and contour, but you won’t lose yourself in the mattress or feel like you’re constantly sinking into it. Sleepers who prefer a cooler sleeping surface will also benefit from the different ways that the eLuxury Supply mattress provides breathability and cooling. 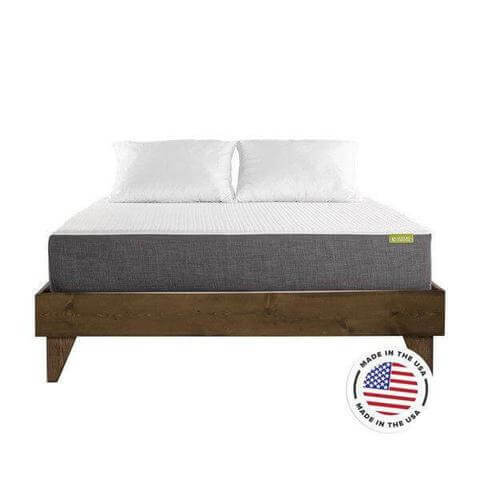 The polyester/spandex cover and gel-infused memory foam layer both worth to facilitate airflow and keep the surface temperature of the mattress down. Savvy shoppers will also favor this mattress because of its great price point. eLuxury Supply does a great job of eliminating unnecessary extras that don’t add much value but add tremendously to the price. Moreover, the discounts that you can find on their products are some of the best in the industry, helping shoppers get a luxury mattress for bargain prices. 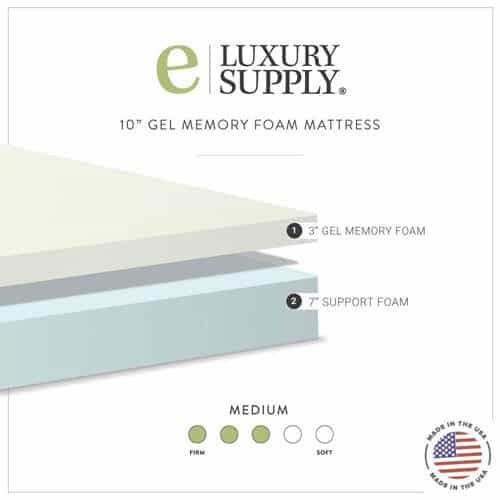 On the whole, the eLuxury mattress is a solid choice for those looking for a good deal on a memory foam mattress. It has a unique blend of traits that work well, and the company offers the products needed to customize the feel of the mattress to make it more toward anyone’s liking. It’s a highly breathable mattress with a cool sleeping surface, and the price almost can’t be beat. Finally, it’s made by a company that has established itself as an outstanding corporate citizen, so buying from them will help contribute to their good works.